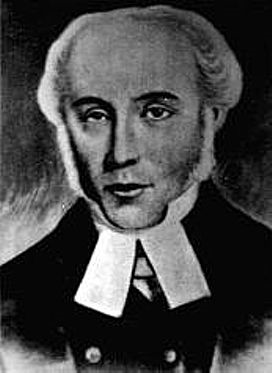 Born in 1791, the nineteenth century Church of England clergyman, John Wollaston, spent most of his life in England. But it wasn’t until he was 50 that he decided to abandon the safe and secure life of an English parish and set off on his lifetime’s adventure on the other side of the world. Today the Australian Church hails him as a saint for his untiring work and for being instrumental in the establishment of the Anglican Church there. Like most saints he has his own saint’s day when he is remembered across the whole continent. John Ramsden Wollaston was educated at Charterhouse, where his father was a master and his grandfather, William Ramsden, was headmaster. He read theology at Christ’s College, Cambridge, graduating in 1812. He was made deacon in 1814 and became a priest a year later. Wollaston spent the greater part of his life as a village priest in England and had links with Cambridgeshire – both as a student and as a clergyman. He served as Curate of Wrotham in Kent, and then Vicar of Elsenham in Essex, before becoming Permanent Curate of West Wickham in south-east Cambridgeshire in 1825. He served there for 16 years, faithfully ministering to its people, but in 1841 he decided to emigrate with his wife and seven children to Australia where he believed his family might have a better future. He responded to an advertisement by the Western Australian Land Company offering land for settlement in Western Australia, where he was offered a chaplaincy at a proposed new settlement on Port Leschenault. Believing that an official stipend would be available to him on his arrival, he and his family set off for Australia. But they were in for a big disappointment. By the time he arrived, the settlement was without a parish and on the verge of collapse; and he was unable to receive his payment until a church building had been constructed. Pioneering days were tough for all who came to Western Australia at that time. Food was short, clothing and footwear scarce, and sickness affected many people. Wollaston found himself nearly destitute. Despite the harsh climate, he built a small timber church at Picton with help from his family in fewer than eighteen months. Dedicated to St Mark, it was only the second church built in Western Australia, and is preserved to this day as a national monument. Wollaston’s energy and efficiency became widely known, and he was asked to minister to the parish of St John’s, Albany. He found the church building partially completed with only the walls and part of the tower complete; there was no roof. With characteristic determination and ignoring the parishioners’ assertions that the parish could not afford it, he completed the nave within a few months. In 1848, he completed St John’s Church there. The building had been started before the church at Picton, and thus he is associated with the two oldest churches in Western Australia. After these successes, he was appointed the first Archdeacon of Western Australia, and for seven years he visited the settled areas of the new archdeaconry, travelling hundreds of miles on horseback in intense heat or heavy rain to make sure the Church was ministering to the people. He was much loved by ordinary people, new settlers and Aborigines alike. He earned a reputation for bringing together the very different clergy of the colony and for his unflagging concern for their welfare. He spent only 15 years in Australia. He died on 3 May 1856, shortly after his second main archidiaconal tour – a distance of around 1,000 miles. It is believed his death was the result of exhaustion. In 1984, the Province of Western Australia proclaimed their first archdeacon, John Ramsden Wollaston, a local saint for his ground-breaking and dedicated work. Later, he was recognised by the Anglican Church throughout the whole of Australia, and his name was added to their calendar of saints. He is remembered each year on 18 September – the anniversary of the first service held in the little church he built at Picton.